Great Fun …….and A big thank you to everyone. This order in my inbox this week for four paintings which Is now flying off to Durham in the USA. This order took my Etsy sales total to over 600 sold paintings. I’m blown away 🥰 Thank you everyone. 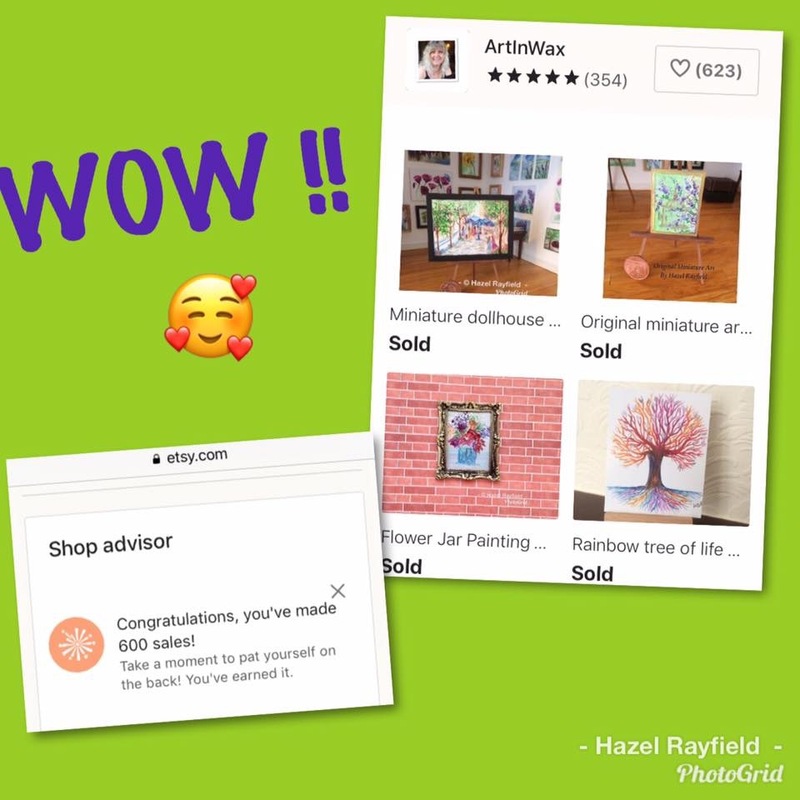 The Etsy platform allows for great communication and a way for me to connect with miniature and dollhouse collectors wherever they are. 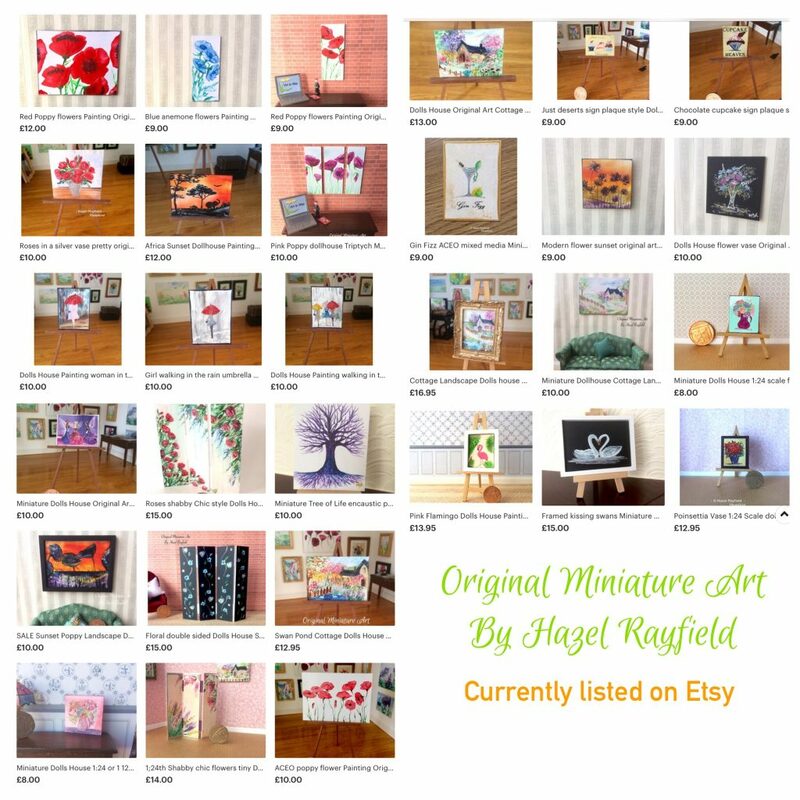 I like the way the Etsy system displays the items in my shop, which I am updating all the time, with several new paintings added this week. 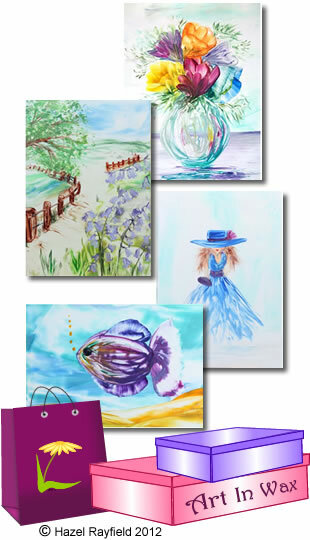 Thesec are just a few of my paintings currently online ….. why not pop over to my shop and see them in full. A collector of my miniature art, who is a dolls house collector and miniaturist contacted me a short while ago as she was starting her latest project, a miniature 1:12th scale haberdashery, come dress shop, come Ladies boutique, in a vintage period style, and she asked me to paint some specific pieces of miniature art for her new project. So I have been commissioned to paint for this interesting project and I’m having a lot of fun painting in the theme, with an open brief my imagination and Wax has been flowing. 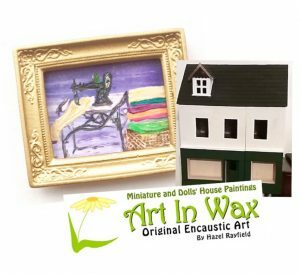 I have worked with Tricia before on her Dance Studio and she has quite a collection of my miniature Art In Wax. 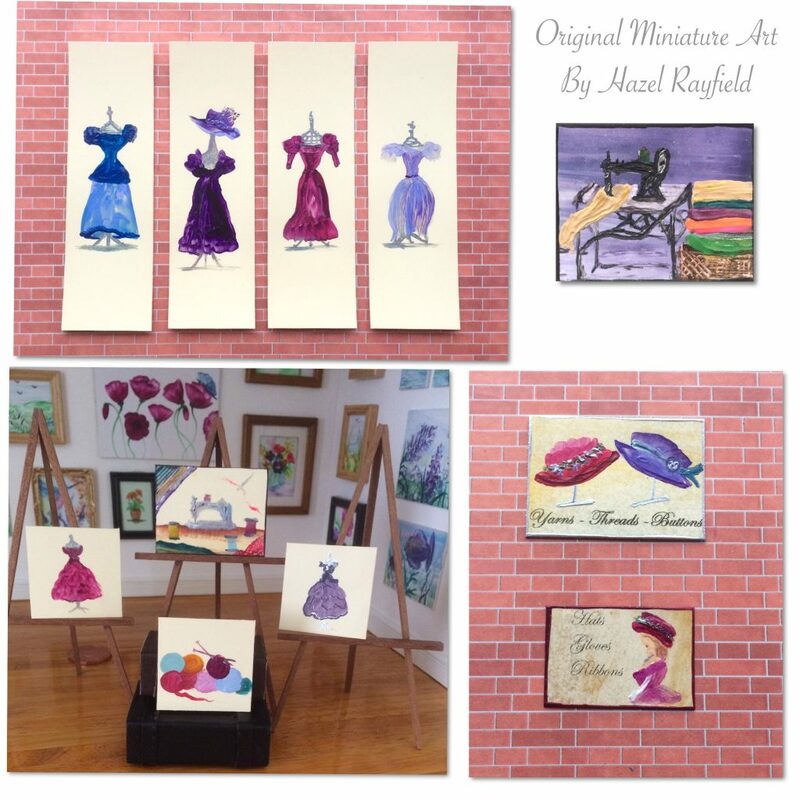 These are some of the paintings for her haberdashery store, which is now underway, the building shell of the shop can be seen in the picture above, once the property is complete I am hoping Tricia will let us see the finished shop, with all it’s Art In Wax on display. The mannequin dress painted panels are 13 cm high and will be mounted in the wall. The panels tie in with the set of four miniature pieces each with the project theme, period style dresses, sewing, threads, wool and yarn. All these pieces are painted in Encaustic paint on specialist gloss card which is cream in colour. The most recent piece, finished this week is the antique style sewing machine and and basket of fabric painting. The two mixed media advertising style plaques, are unusual and a unique challenge of their own. This painting style like a sign, plaque or advertisement works great as a miniature for a dollhouse size shop. Giving a very unique and personal feel to the art. I have in the past painted in this style for property signs and personalised art. The paintings are a combination of ink and encaustic Wax paint. I used my computer and printed the ink lettering into a semi sheen (and semi absorbent) card support then wax painted over the printing, this seals the print into the painting and then I paint the picture. Only the text is printed. Commission A Piece Of Dolls House Art. Commissioning a piece of my art is easy …. so why not Contact me and have a painting commissioned for your dolls house or miniature property. 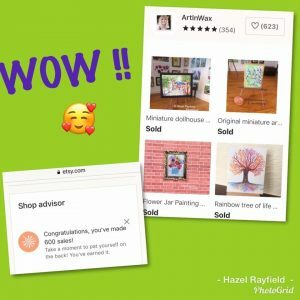 The Art In Wax online shop is now open again, after a short break the shop is now online and open to purchase original art direct from me the artist. All transactions on the Art In Wax website are via Paypal. All the prices in the shop are just what you pay. Postage and Packaging is Free to UK mainland addresses. Art may not be the first thing you think of as a gift, but what a wonderful and different present an original piece of art can be. As a special occasion gift maybe for a wedding or anniversary, as a Thank you present or a home warming gift. Original art makes a great addition to a room, encaustic art has a wonderful sheen and texture and when people see my paintings they are amazed at the fact that they are created using hot wax, can even be a talking point. Art In Wax Shop : All paintings are a one off therefore should a painting be ordered by two people while we are away from the computer the first order, time stamped, will receive the painting ordered, in the event this happens, we will refund the money to the other party and if possible offer an alternative painting. If you would like a painting commissioned then please contact me for details.